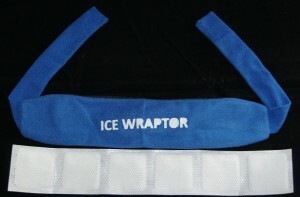 « ICE Wraptor ThermaFreeze Ice Bandanas Now Available! On any given day, the heat can slow all of us down, but for my husband Roy who suffers from multiple sclerosis, heat reshapes his entire ability to function. While we live in a fairly cool climate, warm days cause his multiple sclerosis symptoms to worsen. It also makes his core body temperature soar, and when the mercury rises, we have to find creative ways to minimize his suffering. In the past, I’ve tried using cool cloths on his neck, but the moisture actually created more heat than it reduced. Ice packs were too rigid, and a dish towel filled with a freezer bag full of ice was just too bulky. Since I’m fighting this battle with him, I was determined to find a solution which would give him some relief. 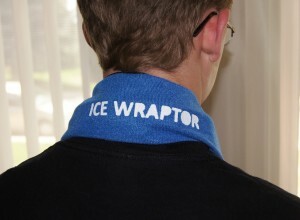 Recently, I came across a variety of ice bandanas on eBay and Amazon, but it was the Ice Wraptor Ice Bandanna from Bent Grass Concepts which had the most to offer. I learned that they are the primary distributor of the ThermaFreeze strips, so I knew going to the source was my best bet. If you’re like many people, heat and multiple sclerosis take a big toll on your energy level and your pain tolerance. The Ice Bandanna is one of the most inexpensive ways to cool your body and reduce heat-related fatigue. Their ice bandanna has some unique features which set it apart from imitators. First, the material. The bandana is made of two different types of material: the plush outer bandanna which makes tying it around your neck more comfortable and the lightweight perforated inner material which allows the cooling effect to transmit to your skin. The ThermaFreeze ice strip inserts are also different from the water-filled plastic strips of the past. In the old version, the sealed water capsules eventually leaked making the strip only partially effective. With the ThermaFreeze strips, there is no water to leak out, so these will have a much longer life span than other versions. And since you can change out the reusable ice packs, we bought and froze extra ice sheets to rotate during the day. You can also use the bandanna or their Ice Wraptor Ice Wraps to soothe joint pain. I’ve seen Roy wrap his bandanna over his shoulder as well as tie it around the top of his head to reduce the pain of a heat-related headache. It’s nice to have finally found a product which delivers on its promise. I also learned that they make instant hand warmers. Like many MS sufferers, my husband has medicine which must be injected daily. The medicine really stings, and our helpful MS support nurse told us to apply heat to the injection site for 5-10 minutes beforehand to reduce discomfort. These Heat Wave Instant Reusable Heat Packs would work perfectly. I’m so thankful I found these products. Supporting my husband in his fight is my first priority, and I have to thank Bent Grass Concepts for designing practical products which are making a difference in his quality of life.